For the second time in a week the rarely experienced spirit of delight appeared at a concert. First the elusive spirit was conjured up by the Suffolk Youth Orchestra at their Snape Prom; then last Friday the mischievous jinn appeared in Jesus College Chapel, Cambridge in the concert seen above. That is singer Shahid Khan in the centre flanked by Jonathan Mayer on sitar and Kuljit Bhamra on tabla. 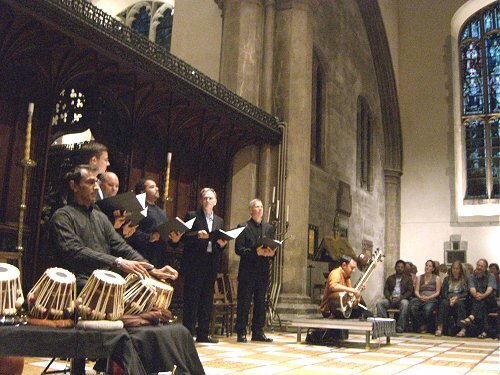 Behind them are the Orlando Consort and the ensemble were performing their Mantra project to a standing room only audience. How many times do I have to say.....? Being moved by the spirit twice in a week is pretty unusual even for this inveterate concert-goer. So I started to ponder on what common factors linked the two concerts, other than the obvious one that none of the musicians involved travel on classical music's big bright green PR machine. There is no doubt the musicians in both concerts were on top form; but, interestingly, I came to the conclusion that what happened outside the concert had been as important as what happened in the hall. Before the Cambridge concert we had taken a bus out to Trumpington and enjoyed lunch at the celebrated Orchard tea garden in Grantchester - oh! yet; Stands the Church clock at ten to three? - after reflecting on the artworks in Jeffrey Archer's garden. We then walked along the River Cam back into the city centre. Similarly, before the Snape concert we had been on one of the most beautiful walks in the British Isles beside another river. 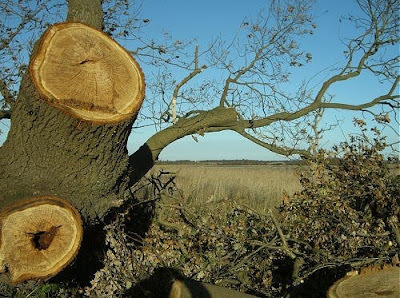 This took us along the bank of the Alde to St Botolph's church at Iken and back. This left time to contemplate Barbara Hepworth's inspiring Family of Man and enjoy a leisurely meal in the Maltings restaurant with its fabulous views across the marshes to Iken before taking our seats in the magnificent auditorium. Even on Friday it was difficult to shut out our data-rich age. We rode out to Trumpington on a bus that offered free Wi-Fi and as the last applause for Mantra died away (or was it before?) the darkness of the chapel of Jesus College was illuminated not by candles but by Blackberry devices downloading the latest ten trivial tweets. I am very fortunate to be retired and have free time. But most people do not have the luxury of being able to slow down and simply be alone with their thoughts before a concert. And with retirement ages rising and pensions shrinking fewer people will have the luxury in the future. At which point we hit the big disconnect, for we cannot expect composers and performers to energise audiences who have taken the background noise and distractions of the twenty-first century into the concert hall with them. Which may explain why classical music is a threatened species in today's pressured world. If it is not being appreciated it will not survive. If there is a quick fix I am sure someone else would have found it. Group meditation, decompression by listening to Bach's 48 or other intellectual equivalents of the monastic great silence before every concert may just be a pipe dream. But isn't it futile to keep thinking classical music can be rejuvenated by changing the way it is presented to audiences? Surely the solution is to be found in changing the way audiences listen to it? In my article about the Suffolk Youth Orchestra I wrote about the need to unblock classical music's arteries. If we are to revive the patient we also need to unblock the ears of listeners and create virtuoso audiences. Which involves challenging the assumptions which underpin the current attempts to revive Western art music. It was not by chance that Benjamin Britten created his Snape concert hall, where I heard that revelatory Rachmaninov symphony, in a remote and beautiful location on the Suffolk coast. Reaching Snape is a labour of love even today, and when you arrive you find yourself in a parallel musical universe where the mud-prone car park deters shiny black company BMWs. London is more than 100 non-motorway miles away, so hedge fund manager cannot dash from their desk to a concert at Snape. All of which explains why concerts there are always so enjoyable and free of the elitist overtones that blight Glyndebourne and other venues. But beware of the canard that 'doing different' is the same as 'being reactionary', because Aldeburgh has always been about the new. Music demands more from a listener than simply the possession of a tape-machine or a transistor radio. It demands some preparation, some effort, a journey to a special place, saving up for a ticket, some homework on the programme perhaps, some clarification of the ears and sharpening of the instincts. It demands as much effort on the listener's part as the other two corners of the triangle, this holy triangle of composer, performer and listener. Britten stipulated "a journey to a special place", both physically and cerebrally. Yet today classical music worships at the altar of instant access, both geographically and technically. Could this very access be classical music's mortal enemy and not its saviour? Pierre Boulez, who sampled the magic of Snape for the first time this year, set an invaluable hare running in the 1960s when he proposed, metaphorically if not literally, that the most elegant way of solving the opera problem would be to blow up the opera houses. This typically discursive and epically long post has hopefully provided some food for serious thought and discussion. 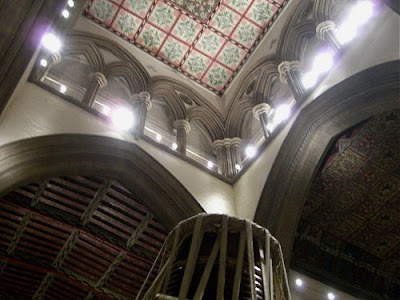 But for the coda it returns to the home key of facetiousness to suggest, pace Boulez, that the most elegant way of making a connection between classical music and new audiences may be to blow up the city centre concert halls. Which then only leaves the latter day equivalent of tape-machines and transistor radios. * Sitar player Jonathan Mayer, who can be seen in the photo above, is the son of a very interesting musician. John Mayer (1930-2004) was born in Calcutta. For many years he was violinist with the London Philharmonic and then Royal Philharmonic Orchestras. He composed a violin sonata that was played by Yehudi Menuhin and was a prominent jazz musician who pioneered fusuions of jazz and Indian classical styles. ** Kuljit Bhamra is working on a tabla notation system. Could this be the catalyst needed to bring this most rhythmic of instruments into contemporary western music? *** Carl Honoré's In Praise of Slow has a thought provoking chapter on classical music tempi. *** What goes around, comes around. 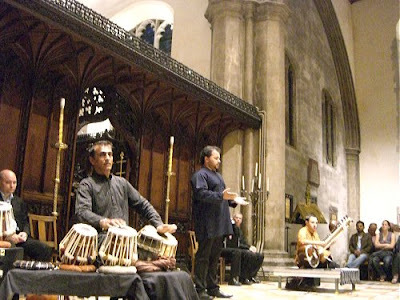 Photo 1 - Singer Shahid Khan centre flanked by Jonathan Mayer on sitar and Kuljit Bhamra on tabla and behind them the Orlando Consort in Jesus College Chapel, Cambridge. 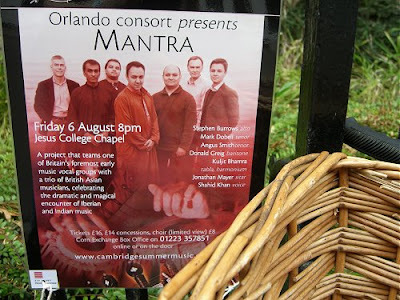 3 - Mantra project poster in the Market Square, Cambridge. 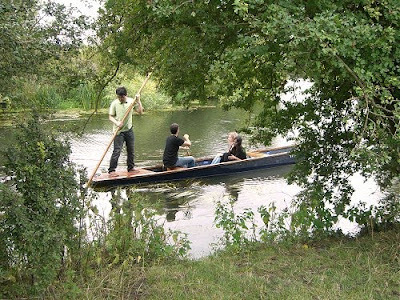 4 - Punting on the River Cam in Grantchester Meadows.